If you’re an avid runner then you’re probably training no matter where you are, even in the busy city. Thankfully, in Washington DC the architecture is built in such a way that there are large patches of greenery to train on. These wide open spaces are great for distance runners and there are trails on harder terrain for endurance runners. Those who want to participate in DC area runs such as the Marine Corps Marathon or Half Marathon can compete in various runs to prepare throughout the year. These will get you fighting fit for the next round and there are a lot of places in DC that offer great places to run. Whether you want to run through the city or in a park, we have you covered. If you prefer to run through the city then Embassy Row offers a great stretch of land to train on. If you need help getting there, or getting back after a long run, then use our Hop On Hop Off service. See some sights, then get your exercise before seeing some more, perfect to fit into a busy time in the city. Even the flags on the embassies can keep your mind active as you run and help you kill the boredom that sometimes comes with running. Try to guess the embassy from the flag alone! 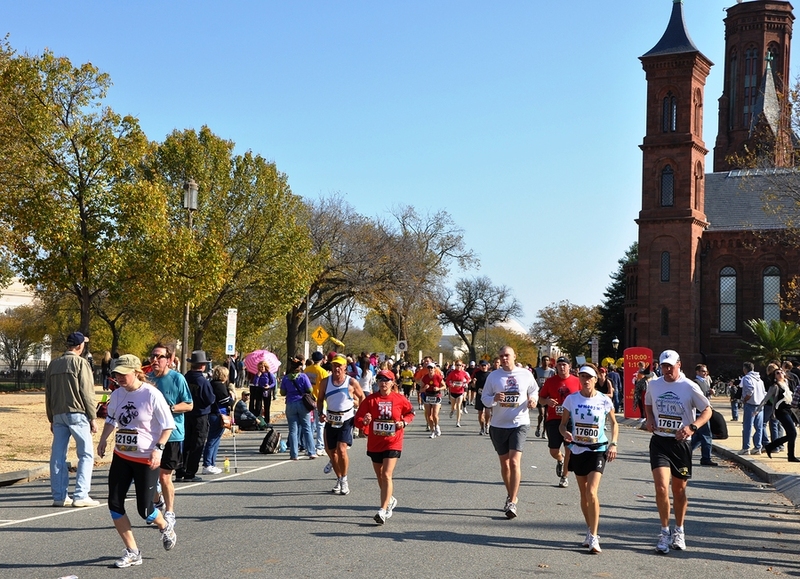 The National Mall screams Washington DC history but did you know that this is a popular place for runners too? The paths that surround the sights are fantastic for runners, as there’s less chance of you stumbling or injuring yourself. These sights can get rather busy at peak times so the earlier or later you go in the day, the better. Nature comes to life in a big way at Beach Drive, as plenty of animals live in the surrounding flora. Deer and birds can often be seen on these runs, which will seem a bit strange to those coming from cities like New York. Expect a great dirt road and miles of the majesty of nature to look at while you make your way through the park. Still finding your feet in the running world? Then check out Rock Creek Park and its little known dirt trails. These paths beside the city take on all types of terrain, so you can work out which kind you prefer to run on. There are flat sections and trails that will take you higher too, so you can test your endurance on each easily. Often the two different trails meet back up further down the line, so you can try one on the way there and another on the way back. Whichever way you choose to run, be sure to take care of yourself and don’t get injured. If you miss out on one, don’t be afraid to take part in the next one and try again. Good luck taking on the crowds and finding yourself at the front of the pack!